1Clinton, RW. The Canadian Paediatric Society Position Statement. Getting it Right at 18 Months: In Support of an Enhanced Well-Baby Visit. Paediatric Child Health 2011;16(10):647-50. http://www.cps.ca/documents/position/enhanced-well-baby-visit– accessed June 25, 2017. 2Guttmann, A., Gandhi, S., Hanvey, Li, P., Barwick, M., Cohen, E., Glazer, S., Reisman, J. & Brownell, M. (2017). Primary Health Care Services for Children and Youth in Canada: Access, Quality and Structure. In The Health of Canada’s Children and Youth: A CICH Profile. Retrieved from https://cichprofile.ca/module/3/-March 25, 2017. Not all disabilities present at birth or are identified during the first year of life. Sometimes, the disabilities are ‘invisible’ during infancy (for example, learning disabilities). Sometimes the disabilities are “visible”, but the signs and symptoms may be difficult to recognize (for example, Fetal Alcohol Spectrum Disorder). Sometimes, parents and health care providers may initially assume that the child will “catch up”. Yet early diagnosis and early intervention are important to the healthy development of children with disabilities and to the well-being of their parents. 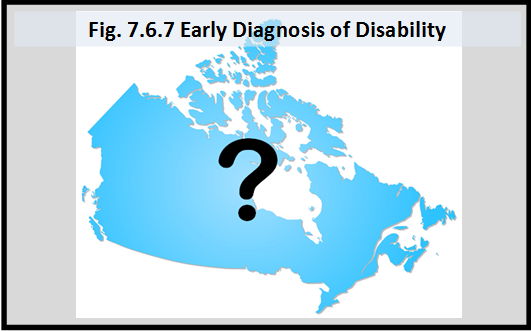 There is a need for national and provincial data on the age at first diagnosis and for research examining the implications of delayed diagnosis for children and their families.